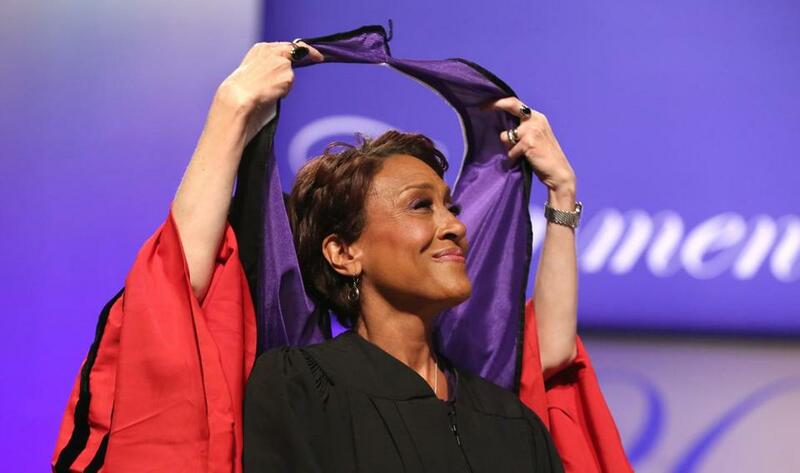 Robin Roberts, co-anchor of ABC&apos;s Good Morning America, was hooded by Michaele Whelan before giving the commencement address at Emerson College. Work hard, dream big, but don’t forget the seemingly small steps that can make all the difference. That’s the advice broadcaster Robin Roberts drove home to Emerson’s class of 2015 at the school’s 135th commencement Monday. The two-time cancer survivor and award-winning journalist provided no shortage of inspiration to graduates, as Emerson conferred more than 900 undergraduate degrees at the Boston Convention and Exhibition Center. More than 300 graduate degrees were awarded in a separate afternoon ceremony. Roberts began on a light, humble note, saying the best graduation gift she could give was a short commencement address, before adding that she wouldn’t be using a teleprompter or any written notes. “I’m just going to try to speak from the heart,” she said. The anchor, who is also known for her work on ESPN and the Academy Awards red carpet, told of how she dreamed of being a sports journalist. But while she was at Southeastern Louisiana University, the only outlet that would give her a chance was a country music station. The university conferred degrees to about 4,000 undergraduate and graduate students at a commencement Monday. Although she had a sports show in the mornings, she was required to DJ on the weekends — and now she’s a huge fan of country music. No stranger to adversity, Roberts stressed that graduates will face unforeseen challenges in their lives and they need to attack them head on. Emerson awarded honorary degrees to Roberts; Anne Hawley, outgoing director of the Isabella Stewart Gardner Museum; former US poet laureate Natasha Trethewey; and physician Cheri Blauwet, who also is a Paralympic medalist and Boston Marathon champion. While Roberts received a warm ovation, student speaker Zachary Ehrlich, who followed her, brought the house down. Ehrlich also advocated for more “care-too-muchers” in this world, and defended the sleeping patterns of most college students. “People like us who stay up until 2 a.m. are behind works like the Mona Lisa, the Magna Carta, and Left Shark” — the entertaining costumed dancer at this year’s Super Bowl halftime show. For the graduating class, which included students from around the world, the ceremony meant the end of one of life’s chapters, and the beginning of another. “This is so awesome, I’ve waited four years for this,” said Kelly Pylinski, a New Hartford, N.Y., native who majored in marketing communications. Pylinski said he plans to work in New York for the time being, then eventually head to Los Angeles.